Peter is a freelancing musician in the North Jersey area who specializes in trombone and euphonium. 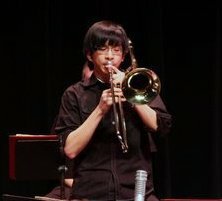 He is currently enrolled as a jazz performance student at William Paterson University, where he continues to study the art of jazz improvisation and versatility as a musician. He also participates and plays in jam sessions and gigs both in New Jersey and in New York City. Peter has experience teaching both private and group lessons. Peter has played with ska bands, concert bands, jazz combos, and small groups that span numerous genres. He has performed with Vanessa Rubin, Dave Gibson, Maria Schneider, Scott Robinson, Bernie Williams, and Antionette Montigue as a featured artist. He is currently a member of the William Paterson Big Band which has played with Maria Schneider, Frank Foster, and Rich Perry. He has played with the Cecil Big Band in West Orange, the Full Count Big Band, and many more. Peter continues to work closely with professional musicians in the area.